Lace-up boots have become trendy again, for work and for hanging out. So why would you buy slip-on boots for a long day on your feet? Pull-on boots are more convenient to put on, and they are more comfortable in hotter weather because they have a looser fit. While most people choose between slip-on and lace-up boots based on their employer’s qualifications, sometimes it is a matter of preference. That’s where we come in. We’ve ranked the top-rated pull-on boots, based on fit, price, and durability. 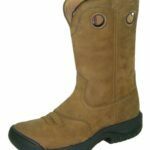 With a slip-resistant, Goodyear welt rubber sole and a leather upper, Caterpillar Men’s Revolver Pull-on Steel Toe Boots are some of the most durable work boots on the market. They have a 14” diameter opening and dual pull handles for handy slip-on. The Caterpillar’s steel toe meets ASTM standards, so you’ll be able to use these boots on a variety of work sites. With a breathable interior mesh lining and a flexible, shock-absorbent PVC midsole, the boot has added comfort for long days on your feet. Although the Caterpillar Revolver is available in wider sizes, they do run narrow and large. Although the company made these boots for comfort, some workers with sensitive feet wish the boot had more cushion. There is a mild-break in period, and the pull-on feature can take some effort until the leather stretches. They aren’t ideal for extremely wet environments, as they are not entirely waterproof. There have also been some minor complaints that the sole separates from the upper and the stitching fails within a year of use. The Caterpillar Revolver is more expensive than most would be willing to purchase new work boots, but their comfort and durability make the expense worth it. They are our top pick for the best men’s slip-on work boots. 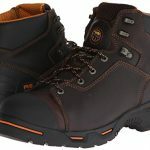 Carharrt has been producing industrial-strength clothing since the late nineteenth century, and their work boots are popular with workers on construction sites. 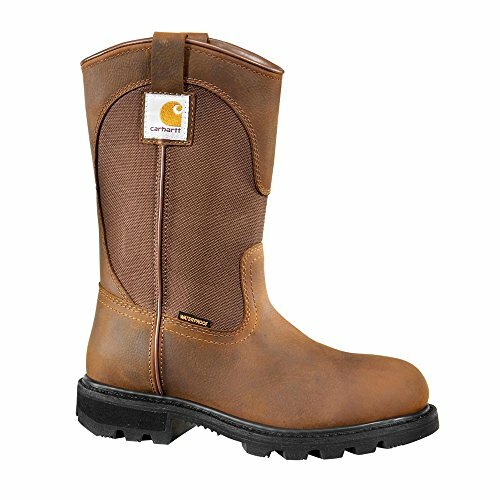 With a durable and breathable leather and textile upper, the Carhartt Women’s CWP1150 Boot promotes safety on the work site. 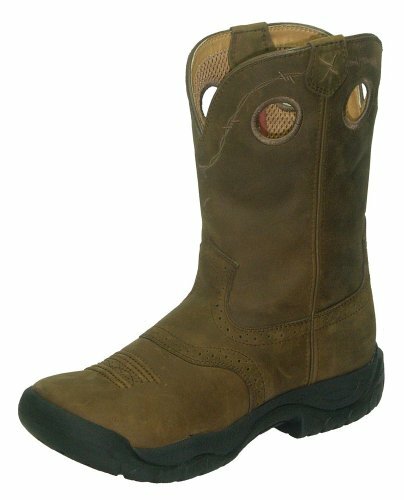 A mid-calf boot with a slip-resistant rubber sole, it meets most safety requirements. It has dual pull tabs to help you slide them on, and a waterproof lining to keep your feet dry and comfortable. This boot’s best characteristic is that there is no break-in period; you can enjoy them right out of the box. The only consistent complaint about the Carhartt Women’s CWP1150 Boot is that the opening, which measures 13.25”, is too narrow for those with large feet. The upper stretches over time, so this problem is quickly corrected. Although the Carhartt Women’s CWP1150 Boot is more expensive than most women’s work boots, they are durable and comfortable enough to be our pick for the best women’s pull-on work boots. 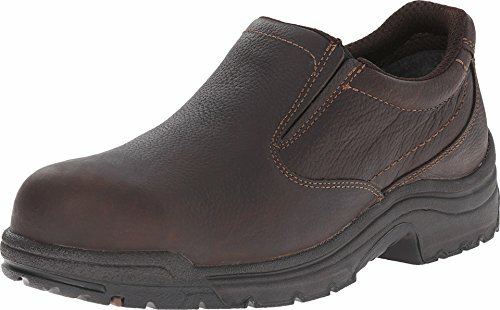 Skechers are primarily known for their trendy footwear, but they have also built a reputation for crafting tough work boots. Perfect for standing or working indoors, the Skechers USA Men’s Dorton Chelsea Boots have removable gel-infused insoles are shock-absorbent to relieve pressure on the ball of the foot and the heel. The boot runs large and wide, with a roomy toe box and a soft interior lining for more comfort throughout the workday. The Dorton Chelsea Boots have a synthetic leather upper with reinforced stitching and rubber outsoles with good traction, holding up well to extended wear. They also have both a heel tab and side panels for slipping on and off. The Dorton Chelseas aren’t suitable for outdoor work. The soles are not slip-resistant, so they won’t fulfill some employer qualifications. The synthetic leather can take some time to break in, and the mouth is smaller than most work boots. Until the leather stretches, they can be a little challenging to put on and take off. The small heel tab can break with rough use. Despite these issues, the Skechers USA Men’s Segment Dorton Chelsea Boots are a budget-friendly, lightweight boot ideal for men who stand on their feet all day. For those who work in messy environments, a good pair of galoshes can save your work boots from ruin. 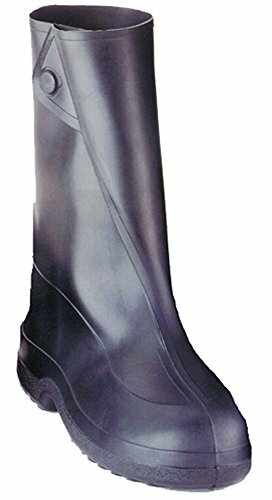 The Tingley Men’s 1400 Pull-Over Galoshes pull over your regular footwear, with an extra-wide mouth and a fold-over snap to protect your feet from wet, muddy conditions. They are elastic and 100% waterproof, keeping your feet (and your work boots) dry all day. The Tingley Pull-Over Galoshes have a kick-off heel cleat so that you can take them off easily without getting your hands dirty. Designed for safety, they have slip-resistant tread and abrasion-resistant soles with toe protection. The Tingley Men’s 1400 Pull-Over Galoshes are unlined, so they won’t keep your feet warm in colder weather. They run small and narrow, so they aren’t ideal for larger feet. One characteristic that these galoshes lack is a side zipper, which would make pulling on and off more convenient. Some users report that they start to fall apart within a year of consistent use, but they are so budget-friendly that you won’t even mind. Wolverine is a trusted name in rugged, durable footwear, and customers in a variety of professions use their work boots. 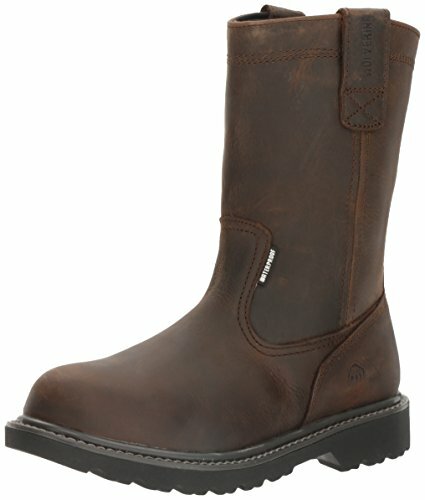 The Wolverine Men’s W04727 Wolverine Boot combines protection and comfort with the convenience of a pull-on boot. 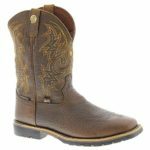 This mid-calf boot has a slip-resistant, Goodyear welt rubber sole with excellent traction for uneven terrain. Nylon shanks in the sole stabilize your feet, and the removable EVA foam insole adds comfort for the ball of your foot and your heel, two areas that take the most impact during the long work day. The Wolverine W04727 Boot is extra durable, with 100% Nubuck leather to protect your feet up to your calves. Side pull loops and a soft interior lining help you slide your foot into these work boots. Although they are great for rough environments, the Wolverine W04727 Boots do not have a safety toe. They run narrow, and there have been some complaints that the opening is not big enough for larger feet. Some minor reports mention that the heel slip falls apart, and the inside stitching unravels within a year of use. The Wolverine W04727 Boot is on the expensive end of the price point for work boots, but their comfort will keep your feet happy. Most workers who need quality work boots turn to Timberland. The Timberland PRO Men’s 53534 Titan is a low-top, steel toe work boot that offers foot protection in several different environments. A 1.5”heel and nylon shank in the sole provide shock absorption, and the slip-resistant rubber sole prevents work-related injuries in slippery conditions. Timberlands are known for their comfort: the Timberland PRO Men’s 53534 Titan’s flexible polyurethane midsole, removable cushioned outsole, and padded tongue combat foot fatigue. An anti-microbial mesh lining pulls sweat away from your feet, and Timberland’s Outlast Adaptive Comfort technology make the boots breathable. 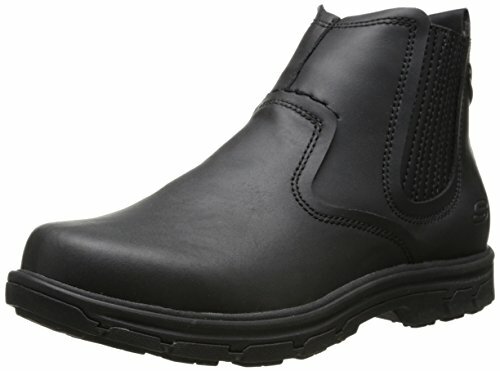 This premium slip-on work boot has a leather upper with elastic goring that shapes to your foot in a more secure fit than other pull-on models. Armed with the Powerfit technology to support your natural gait, the Timberland PRO Men’s 53534 is a comfortable, lightweight work boot that is easy to slide on and off. There is a mild-break in period with the Titan. The leather can be very stiff during the first few wears, especially around the ankle and toe. The Timberland Pro Titan has a roomy fit, but they tend to run narrow and large. 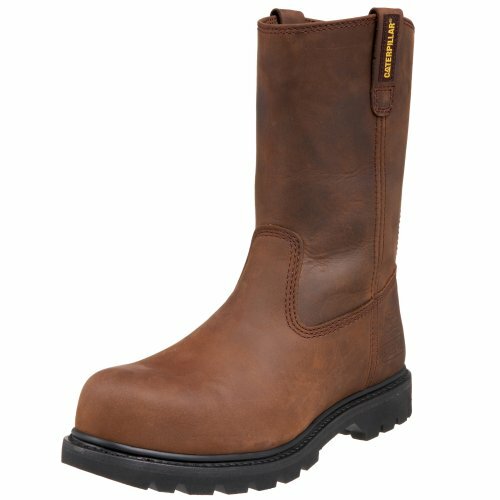 The quality of construction and materials in the Titans make them expensive, but Timberland products last longer than boots by most other manufacturers. Some customers have reported that the Timberland PRO Men’s 53534 Titan Boots scuff easily and that the seams unravel, but their quality outweighs these minor manufacturing defects. Ariat has been in business for over twenty-five years, making long-lasting footwear for equestrians. Several of their models are comfortable enough to wear on any work site. The Ariat Women’s Tracey H20 Boot has a waterproof, full grain leather upper that protects your feet from injury while keeping them dry. With a flexible opening that makes putting them on and taking them off a breeze, this ASTM-certified composite toe boot has a slip-resistant rubber outsole with a 90-degree heel and a shock-absorbent EVA core to support your heel and the ball of your foot. 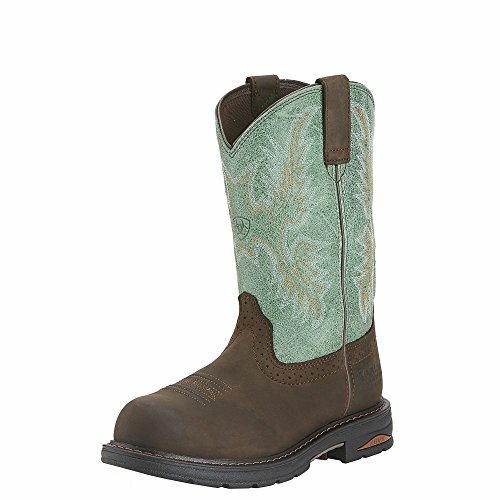 The Ariat Women’s Tracey H20 Boot was made to be comfortable, with an interior mesh lining and a removable insole for extra cushion. With excellent traction and arch support, the H20 Boot is ideal for several different environments. The leather in the upper can be stiff, but it loosens after a mild break-in period. These boots run large and narrow, so your toes won’t get bunched at the front of the boot. Although they are an expensive pair of work boots, your feet will stay comfortable and dry throughout the whole work day. Although the name Caterpillar is more recognizable for their heavy-duty equipment, the company also manufactures reliable work footwear for men and women. The Caterpillar Fragment Nano Boot has a nano composite safety toe that is lighter than steel, while retaining the same strength, decreasing the overall weight of the boot. The real winner of the Caterpillar Fragment Nano Boot is its support. This ankle boot has an advanced cushioning system similar to athletic shoes, making them much more comfortable than most work boots. 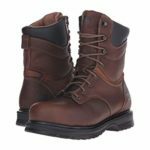 The sturdy leather upper protects your feet and ankles from injury, and the slip-resistant synthetic sole prevents you from falling on most work sites. These boots run small, so you will have to choose a size up from your usual footwear. There have been some complaints that the side zipper breaks, but the failure is consistent with heavy use. A heel tab and a side zipper make the Caterpillar Fragment Nano Boot more convenient than other models, justifying the high price tag. Twisted X is not a well-known brand, but they have built their reputation on creating handmade footwear for men, women, and children. Their Twisted X Women’s All-Around Boot is a water-resistant leather boot is great for working in muddy or wet conditions, and they have a warm interior that stands up to cold weather. Twisted X designed this boot for women who are on their feet all day. The large toe bed gives you enough room for constant movement without crushing your toes, and the toe guard protects your toes from injury. The XSD composite shank in the outsole creates a stable foundation with support in the problem areas of the foot. The removable memory foam insole pulls sweat away from your foot, and it is washable to combat odors. The Twisted X Women’s All-Around Boot comes on the more expensive end of women’s work boots, but the real seller of these boots is the convenience of the pull hooks. Unlike other models that have hooks attached to the upper that can easily break, the Twisted X Women’s All-Around Boot has finger hooks incorporated into the design of the boot. The Twisted X Women’s All-Around Boot runs narrow, with a small mouth. Despite the convenience of the sturdy pull hooks, women with wider feet can have a problem sliding on these boots. The Wolverine Women’s Floorhand Waterproof 10” Steel Toe Work Boot is a moderately-priced option for women looking for a sturdy, protective work boot. With a 100% leather upper, the boot is strong enough to withstand a multitude of rough environments. The slip-resistant rubber sole and soft toe are allowed in a variety of professions. 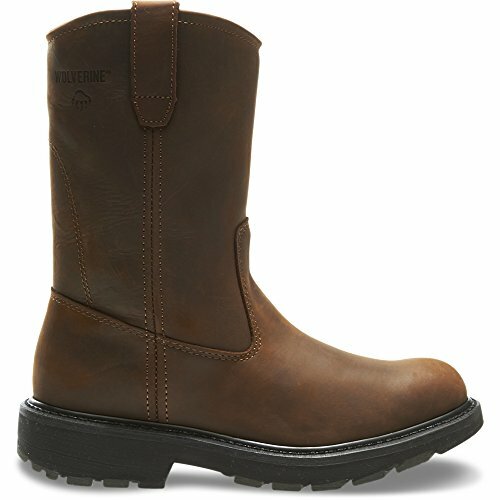 The Wolverine Women’s Floorhand Waterproof 10” Steel Toe Work Boot has both comfort and support. The outsole is reinforced with cement to fight leg and foot fatigue. The soft cushion in the insole and midsole give you extra bounceback, making sore feet after a long day a thing of the past. These boots are not insulated, so they are not suitable for frigid environments. They also run small, so you will have to purchase a size or two up from your standard size. There is also a mild-break in period for the leather to stretch, but this should not last more than a week. Some customers have noticed that the Wolverine Women’s Floorhand Waterproof 10” Steel Toe Work Boot is slightly heavier than other similar work boots, so it would be perfect for you if you like weighty footwear. There have also been reports that the waterproofing failed, but this isn’t a problem if you don’t work in extremely wet environments. Which is better – lace-up boots or pull-on boots? While lace-ups have a snugger fit, the ability to slide into your boots before your workday appeals to many. After in-depth research and consideration, we choose the Caterpillar Men’s Revolver Pull-On Steel Toe Boot and the Carharrt Women’s CWP1150 Boot as the best slip-on work boots. Both models’ benefits outweigh their shortcomings. They both follow most safety precautions, and they are long-lasting footwear that makes their expense worth the investment. 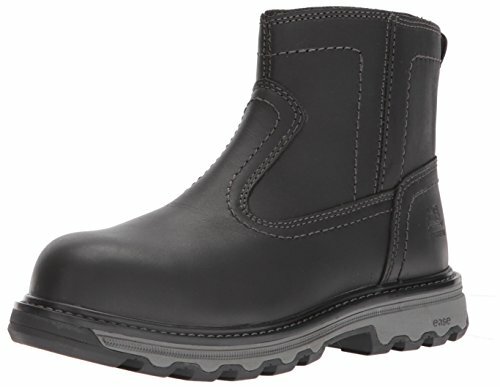 “Safety Lace Up Boots vs. Slip-On Boots.” https://careertrend.com/about-5387316-safety-boots-vs-slip-boots.html. “Standard Specification for Performance Requirements for Protective (Safety) Toe Cap Footwear.” https://www.astm.org/Standards/F2413.htm. Twisted X Boots Review – The Most Comfortable Handcrafted Boots?